I am next in line for SIX of my NINE holds at the library. I like to refer to this as the Library Danger Zone. It’s my nightmare that I get all the books I’ve been waiting for all at the same time! While I do get to keep them checked out for 21 days, and consider myself a fast reader… There’s no way I can read 2 books at the same time! I am really really excited for some of these books. I hope that I have enough time to read and savor each one fully – I have been waiting for some of these titles for a MONTH, and for Missoula over 2 MONTHS! 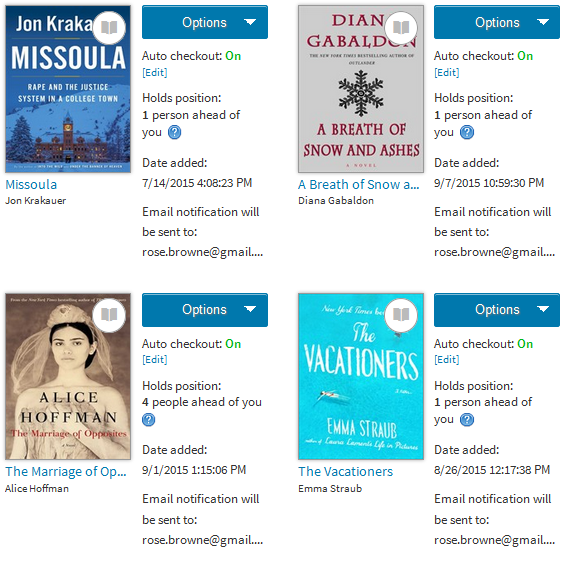 The one redeeming factor is that I’ve already read a third of The Vacationers – my library loan ended before I finished, and the ebook was taken away from me. This is one benefit of borrowing ebooks – you can’t keep them past their due date. It keeps me motivated to keep on reading – especially when I’ve been waiting for months to get a book, there is no way it is going to languish on my end table! And then be taken away before I’m done with it!! Oh hell no. I will keep you updated if Library Book-pocalypse happens…. I really hope it doesn’t, and that I get a few days head start on each before they start rolling in. Keep your fingers crossed for me! Originally from Sacramento, CA, I am a proud UCLA alum who currently resides in St. Louis, MO. I enjoy reading, and am challenging myself to read 60 books during 2015. My other interests are crochet, tumblr, Project Runway, puppies of all shapes and sizes, make up and beauty trends, and long walks around my neighborhood.